A man and his dog move through a frozen snowy landscape. The only other movement,a group of crows in the air. 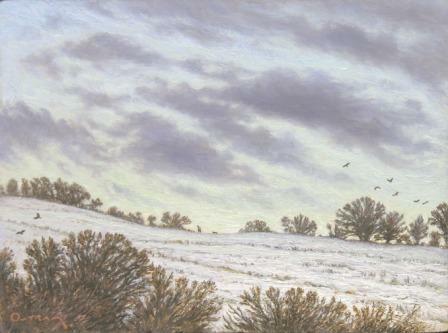 The use of one single figure in his art is typical of Steven Outram''s work. The figure adds scale to the painting and also emphasizes the small scale of man in a work where the large and beautiful landscape is the real star. In all his contemporary art works Steven Outram succeeds in portraying the utter beauty and majesty of the countryside around him. His capacity for observation and distinctive style creates fresh and absorbing paintings. In addition to Red Rag British Art Gallery Steven Outram has exhibited at other leading British Art Galleries. Each painting at Red Rag is sourced from the Steven Outram artist studio and like all Red Rag British art and Contemporary art it can be shipped worldwide. Steven Outram was voted a member of the Royal Society of British Artists in 2003.